Pick this Glowing Marvel 30 Red N White Roses Premium Bouquet to greet the novel bride of your family and tie with her through floral radiance. This Assemblage presents Vibrant Red and White Roses combined together by Chic Ribbons and further decorated with Green Leaves. Pick this Glowing Marvel 50 Red N White Roses Premium Bouquet to greet the novel bride of your family and tie with her through floral radiance. This Assemblage presents Vibrant Red and White Roses combined together by Chic Ribbons and further decorated with Green Leaves. 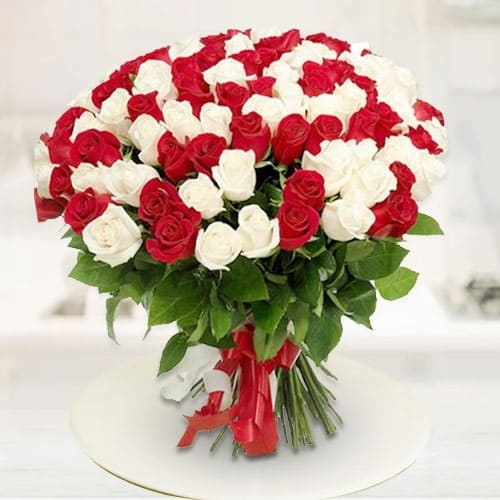 Pick this Glowing Marvel 100 Red N White Roses Premium Bouquet to greet the novel bride of your family and tie with her through floral radiance. This Assemblage presents Vibrant Red and White Roses combined together by Chic Ribbons and further decorated with Green Leaves.